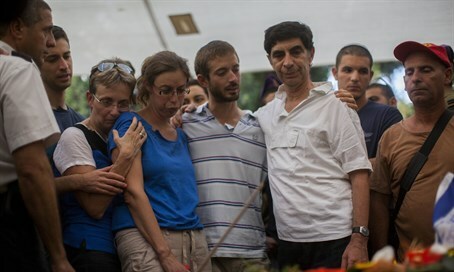 Leah Goldin, the bereaved mother of fallen IDF soldier Hadar Goldin whose body is still being held by Hamas in Gaza, spoke with Arutz Sheva about what the government must do in order to allow her to bury her son. Goldin recalled how her son was fighting in Operation Protective Edge in Gaza last summer, and served as an officer in the Givati commando unit. On August 1, he was killed in a Hamas ambush in breach of a ceasefire which had just come into effect, and his body was kidnapped by the terrorist organization. Aside from Goldin, the body of IDF soldier Oron Shaul is also still being held by Hamas from the war. "A year and four months, we're still waiting to bring Hadar home, and Oron Shaul as well," said the bereaved mother. Goldin noted that she was warned that the return of her son's body "will cost," like the 2011 Shalit deal in which 1,027 terrorists were released for IDF soldier Gilad Shalit. However, she notes she "tried to turn over the equation, saying: 'yes it will cost, but it's not for Hamas to define the cost, we should be active and define the cost.'" Instead of waiting for Hamas demands, Israel should find ways to make Hamas pay a price for keeping the bodies and thereby convince them to return Goldin and Shaul, she said. Doing so will require dynamic action from Israel, but she noted that the current situation in which the world is trying to rebuild Gaza offers a perfect opportunity to take action. If the world wants to rebuild Gaza, "that's fine, but just put one condition - bring Hadar and Oron back before anything is started in Gaza." "Same with the bodies, why should the mothers of the terrorists celebrate while I and Zehava, Oron's mother, are still waiting for our son's bodies?," she posed. Just this Saturday, the government breached a Security Cabinet decision and returned the bodies of five Arab terrorists. In order to further the cause, Goldin noted her family and Shaul's family have been speaking with the government and have gotten a "good reaction," but it isn't enough, and therefore they plan to go abroad to the international Jewish community. In two weeks a campaign will be launched in New York by the bereaved families, meeting with rabbis and community leaders to stress the urgency of their right to bury their dead. Goldin also spoke about her son's exceptional artistic skills and the exhibitions that have been held of his work, with another upcoming one planned in the Golan Heights.